Tutbury Castle sits on top of a hill in rural Staffordshire, not far from the town of Burton upon Trent. The castle was first recorded in 1071 and it’s perhaps most well known for being one of the prisons that held Mary Queen of Scots. She was held here on 4 separate occasions in fact and it was here that she became involved in the plot that ultimately led to her execution. Today, the castle is mainly in ruins, but there’s still plenty to see. Although much of your visit will involve climbing the external ramparts and turrets, a brick-built central keep is still in decent condition and provides an internal aspect to your visit. This main room is now used for weddings and you can sense the history of the place when you’re inside. Our children spent quite a bit of time chatting to the costumed guide in this room who explained more about the castle’s history and what the room was used for. There was also a heavy sword for them to try and hold and they loved it! The thing we all enjoyed most though was climbing the spiral stone staircases to see some terrific views of Staffordshire and neighbouring county Derbyshire. There are also further rooms inside the ruined walls to explore, some with roofs and some without! All in all, we had a very pleasant family visit. Whilst Tutbury is by no means the most impressive castle you’ll see in the English Midlands, it does make the most of what it has, the views are lovely and we thought it was decent value for money especially on weekdays. There is also a tea shop on site enabling weekday special offers like entry with a cream tea! 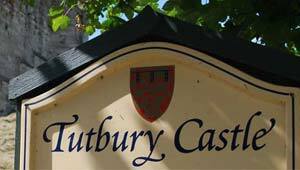 Whilst at the castle, spare a little time to wander around the village of Tutbury itself. The main street is lined with independent shops selling antiques, clocks, crafts and gifts.